SEOUL, March 18 (Yonhap) -- South Korea's top diplomat said Monday the United States wants a deal with North Korea on a "big picture" roadmap to get rid of its nuclear and missile programs. On the other hand, in the Hanoi talks held in late February, Pyongyang limited its immediate denuclearization steps to the Yongbyon nuclear complex, according to Foreign Minister Kang Kyung-wha. She was talking about why the two sides failed to reach an agreement in their second summit. 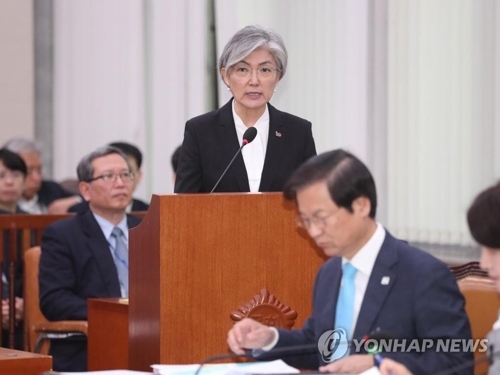 "Both the U.S. and South Korea think that a comprehensive roadmap is necessary," she said at a National Assembly session on her ministry's affairs. "It appears that the U.S. took part in the summit with that position." 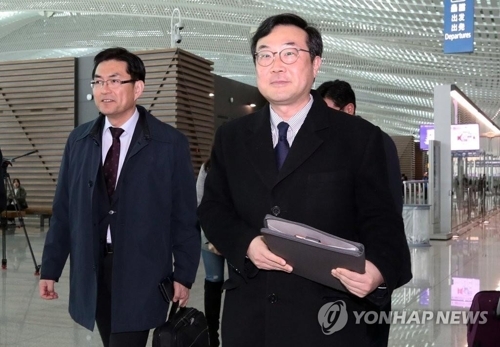 Asked to elaborate, the minister said it means starting the full-fledged denuclearization process with a "big picture" to deal with all elements related to North Korea's nuclear and missile facilities and capabilities. The U.S. maintains the stance that it will be able to lift sanctions on Pyongyang if complete denuclearization if achieved, she said. "Clearly, the time to discuss such a lifting of sanctions will come some day," she added. "For that, it's necessary to pull off slightly bolder denuclearization measures." With a timetable in hand, the U.S. may be open to an incremental formula for the negotiation of details including methods of implementation, Kang said. In the Hanoi session, North Korean leader Kim Jong-un offered to dismantle the Yongbyon facilities, known as the crown jewel of the regime's nuclear weapons development, in the presence of U.S. experts. He demanded the lifting of several U.N.-led sanctions in return. President Donald Trump, however, walked away, saying it falls short of his expectations for the communist nation's denuclearization steps. In a report to lawmakers, Kang's ministry earlier said Trump focused in Hanoi on clarifying the definition of denuclearization, freezing all weapons of mass destruction programs run by Pyongyang and crafting a roadmap. But Kim was more interested in striking a deal on measures Pyongyang can take "at the current stage," it added. Kim's approach reflects his country's call for a step-by-step, action-for-action formula, versus Washington's big deal scheme. But Trump's plan does not mean North Korea won't get anything if it does not agree to the "big picture," Kang explained. "The U.S. stance is that the negotiation must come with the big picture in mind. It does not mean 'all or nothing,'" she said. "A comprehensive deal comes first and then we can talk about going step by step. (Washington) has learned its lesson from past negotiations with Pyongyang that a one-by-one approach before anything else won't work." Kang, meanwhile, made clear that South Korea is a "core party concerned" in the denuclearization process and is apparently troubled by the Hanoi summit having ended with no breakthrough. "There's no denying that we play an active role in (resolving) this problem directly linked to our national security and interest," Kang emphasized. She said sending a special envoy to North Korea may be an option and also agreed with the view that holding another inter-Korean summit could be conducive to revitalizing denuclearization talks. Doubts have grown about South Korea's role in the process. The Moon Jae-in administration, credited with having played a leading role in creating the dialogue mood, hopes to facilitate the resumption of Pyongyang-Washington negotiations. In recent weeks, South Korean officials have formally described Seoul's role as that of "facilitator," instead of using the words "mediator" or "arbiter." North Korea's Vice Foreign Minister Choe Son-hui played down Seoul's stature, reportedly saying it is just a "player, not an arbiter." Speaking to some foreign reporters in Pyongyang last week, she was also quoted as saying Kim will decide soon whether to continue dialogue in consideration of Washington's attitude. Seoul's top nuclear envoy, Lee Do-hoon, also said his nation is a "key player" in the push for denuclearization and lasting peace. Heading to Russia for consultations on North Korea, Lee said, "At this moment, I think, it's important to have close consultations with other countries, join hands and resolve the problem." He is scheduled to meet with Russian Deputy Foreign Minister Igor Morgulov, who doubles as the country's top nuclear negotiator, in St. Petersburg on Tuesday (local time).